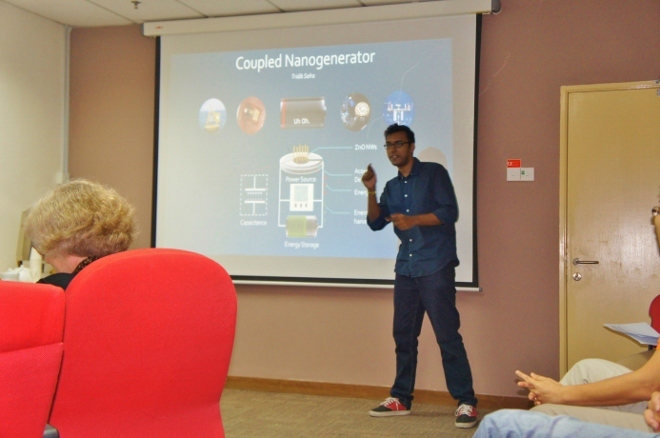 Mr. Tridib Saha represented the School of Engineering and won the Campus-wide 3 Minute Thesis competition in July 2014. He presented his fascinating research entitled “Exploratory investigation into acoustic transducer based coupled resonator system for energy harvesting applications”. He is currently doing his research in the Nanodevices and MEMS Fabrication Laboratory in Monash Malaysia to develop new nanogenerators based on quartz crystal microbalance and zinc oxide nanowires.